This is another quick and easy recipe. 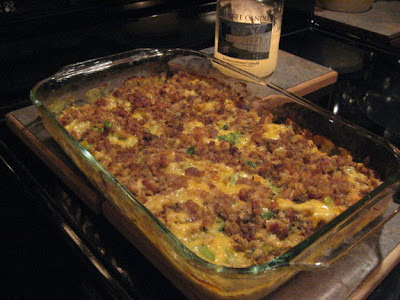 I actually adapted it from a recipe I found on the back of a box of Stove top stuffing Its one of those less than 10 minute prep throw everything in a pyrex pan and bake recipes. 1.Throw broccoli and chunked raw chicken to a 13x9 glass pan. 2.Stir together soup, milk and cheese. Dump over chicken broccoli mixture.